1 month after his Chronicles part.1, our man is back again with a second collection of truly different tunes. 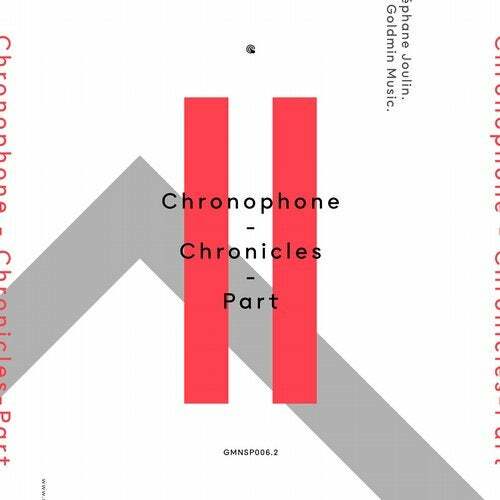 Stephane Joulin alias Chronophone is not what we can call a "newcomer" as our man has been carefully working year after year to create his own sound, he actually started his new "Chronophone" project back in 2010 in order to bring a greater depth to his music. As influenced by the futuristic and timeless touch of Detroit as the epic and more modern, call it post-iphone sound of today's European scene, he quickly got the attention of not so unknown guys.. End of 2012, Derrick May played his unreleased track "Eiffel in love" in his "Behind the dance" Mix Cd. This unique uplifting track seems to be quite unanimous as later, the one and only Franois K (Body & Soul) mentioned this track as one of the 10 greatest electronic music pieces ever produced! - his words: "Mesmerising trumpet work, this is forward-thinking techno the way it should be - dripping with electronic soul and totally spaced-out. Makes it easy to turn the dance floor into the 'cosmic unknown.'" Part. 1 which features that "Eiffel in love" among others was a great introduction to the man's magic and mystery and this new part.2 only confirms the initial impression.. Forget the so-called genres, it isn't techno, deep-house nor minimal (even though, your shop may need to classify it), It's Chronophone! It all starts with the epic "Ville lumire".. Can you imagine yourself walking down the streets, in a big city at nightfall with a touch of wind grazing your face? Maybe you can't but whatever you may actually feel listening to it, you couldn't refuse to let yourself go to this flowing track. There's some magic into it, really! "Bahia Inglesa" is another balearic-house jam almost as memorable as "Eiffel in love".. You get the deal from the very first seconds.. LUSH! Stphane has actually always been into a very contemporary use of brass instruments.. Stephane is a master when it comes to divert any acoustic instrument from it's usual role. Ok, we lost you guys, it's too technical... A big challenge not to use superlatives again with "Belle".. It's the first track we listened from Chronophone in our studio, we crushed on this one from the very first listen and we knew we had to work with this man.. Not sure if we ever heard such a perfect mix of acoustic, synthetic, organic sounds before.. Everything in it's right place.. Last number, "Julia" is another impressive organic tune, slightly deeper in the real goddamn sense of the word, real avant-gardiste track giving us the chills right now while listening to it and writing this descriptionself-review text. Cheers!